Apple has explored building displays with dynamic backlight adaptation for better picture quality, particularly when watching letterboxed widescreen movies on a high-definition screen. The concept was revealed this week in a new Apple patent application discovered by AppleInsider. The filing, entitled "Dynamic Backlight Adaptation for Black Bars with Subtitles," focuses on improving picture quality when watching letterboxed content, like Hollywood movies, on an LCD display. The application was filed just months ago, in September of 2011, and comes as rumors of a full-fledged Apple television set continue to build. One report this week claimed that Apple design chief Jonathan Ive has a 50-inch prototype set located in his secure work studio at the company's corporate headquarters. A common problem with LCD displays is the ability to show "true" black colors on the screen. This becomes amplified when black bars are included in a video, such as when watching a letterboxed film. The difficulty of adjusting the backlight properly when the black bars are present can result in poorer quality of the remainder of the video. Even though modern television sets are built with widescreen 16-by-9 aspect ratios, Blu-ray and DVD films, as well as those sold on iTunes, often show movies in an even wider format, leaving black bars at the top and bottom. For example, many movies are shot in Panavision's 2.35:1 ratio. "Many video images are encoded with black bars, e.g., non-picture portions of the video images," the filing reads. 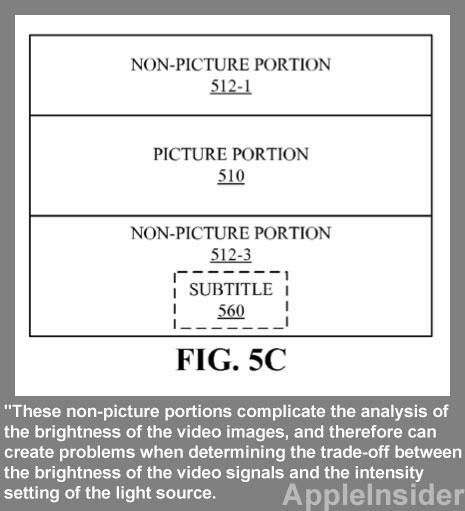 "These non-picture portions complicate the analysis of the brightness of the video images, and therefore can create problems when determining the trade-off between the brightness of the video signals and the intensity setting of the light source. Moreover, these non-picture portions can also produce visual artifacts, which can degrade the overall user experience." Further complicating picture quality and brightness is the fact that users can often view subtitles in the black bars located at the top and bottom of a widescreen film. This makes it even more difficult for the system to dynamically adjust and ensure the highest level of quality. Apple's solution is a complex processing system that could "spatially vary visual information" on a display. This would dynamically adjust the backlight source on a screen, like a high-definition television set, in a way that would improve the picture quality. The display would have multiple brightness settings for its backlight based on the processing of the image. For example, the "picture portion" of the screen would be illuminated by LED backlighting to an appropriate level, whereas the "non-picture portion," which would include the black bars, would have a different backlight setting. The application describes an "extraction circuit" included in the display, which would calculate a brightness metric associated with the video signal. Then an "analysis circuit" would analyze and identify specific subsets of a video, like black bars that are shown when watching a movie. The display would also include an "intensity circuit" that would determine the ideal intensity of the light source that illuminates the LCD display. The system could also employ a mapping function to determine optimum quality by using features like a "distortion metric" to limit image distortion. 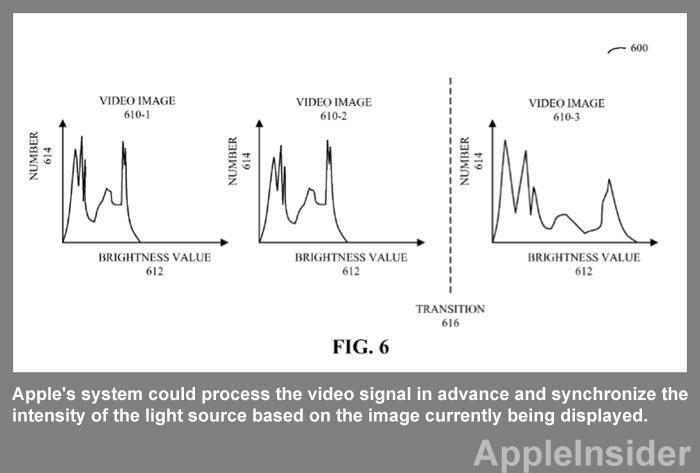 Apple's system could also process the video signal in advance and synchronize the intensity of the light source based on the image currently being displayed. "The system determines the intensity setting of the light source on an image-by-image basis for the sequence of video images, where the intensity of the given video image is based on the brightness setting and/or brightness information contained in the video signals associated with the given image," the filing reads. "Then, the system synchronizes the intensity of the setting of the light source with the current video image to be displayed." The filing, made public this week by the U.S. Patent and Trademark Office, is credited to inventors Ulrich T. Barnhoefer, Wei H. Yao, Wei Chen, Barry J. Corlett, and Jean-didier Allegrucci. Though rumors of a full-fledged Apple television set have persisted for years, they picked up once again late last year, when it was revealed that Apple co-founder Steve Jobs told his biographer that he had "cracked' the secret to building an integrated, easy-to-use television set. "It will have the simplest user interface you could imagine," Jobs said, prompting speculation that an Apple-branded television would use Siri, Apple's voice control software featured on the iPhone 4S, as its primary input method.